You know you need to grow your email list. You’ve heard it repeated over and over again: the money is in the list. Even if you feel like you’re a long way from selling products to your list… you’re still dutifully creating freebies to offer your potential subscribers. But, creating freebies takes time. Especially if you’re a perfectionist! And what if nobody’s picking up what you’re putting down? What then? Well, what if you there was a way to grow your list of subscribers, with way less work and much more fun? What LipSense colour are you? There’s something about this type of question that’s irresistible. We all love to learn something new about ourselves and find new ways to identify and categorize ourselves. Quizzes can be fantastic for getting new subscribers – it’s fun, fresh and if you do a great job, people will take care of sharing it for you! Now, I’ve tried creating a quiz with a plugin before and it was really unintuitive, insanely complex, and required you do the steps all upside down and backward. I’m pretty techy, but… ain’t nobody got time for that. Luckily for me, a friend recommended I try Interact. Guys, this tool makes it so easy! It’s so user-friendly and intuitive I had my first quiz up and running in an hour. Even better there are loads of pre-created quizzes build by experts and designed to convert that you can use to build off if your inspiration is running low. It’s such an easy way to get started with quizzes! Psst… you can get started for FREE! 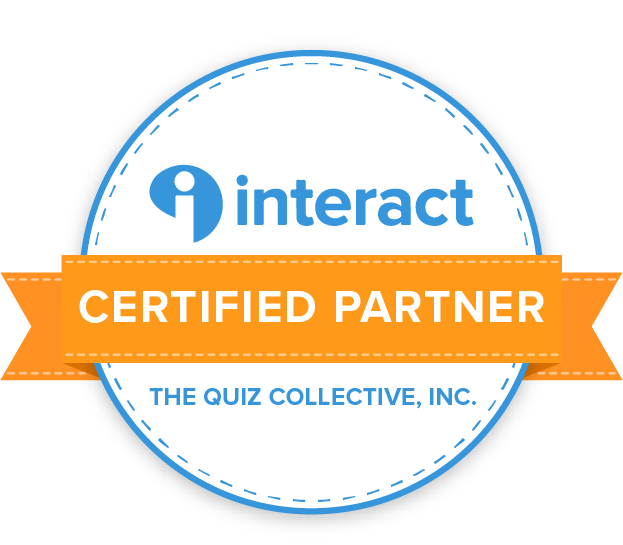 Full disclose: I loved Interact so much I became a Certified Partner! A personality quiz [most popular option for bloggers!] – for example, what icecream flavour are you? An assessment quiz – for example, how much do you know about Harry Potter? (each question has one right answer) <<< great for my infopreneurs and quiz creators who want to add results assessment! A scored quiz – for example, what’s your blogging IQ? What blogging stage are you at? How much do you really know about labor and delivery? How much do you know about parenting a newborn? How much did you learn in Module 1 of your course? How Do You Create A Quiz Using Interact? As I mentioned before, Interact makes it really easy to build a quiz. But. Why not try it for yourself? Sign up for an account with Interact. Choose one of the dozens of pre-made quizzes (if you like) or click on Create Quiz from Scratch to get started. For this tutorial, I’m going to assume you picked the from scratch option. Choose what type of quiz you want to create. In this tutorial, we’re just going to look at Personality Quiz. Click Choose This Type. Now let’s work on your Quiz Cover Page. Add a description for your quiz. Change the button call to action (if you want). Click over to Styles and you can change colors, fonts, and add your logo (if you’re on a premium plan). You can choose between a text answer and an image answer. You can add a cover image for the question. Did your brain just explode with endless possibilities? Mine did! Click on Edit Result Correlations. Assigning results to answers could not be easier. Just click on the dot next to an answer and then click on the result it correlates to. Simple! Once you’ve filled out all your results and have added enough questions (5-7 is a good number), you’re ready to set up your opt-ins and social sharing. Click Enable lead capture and data collection for my quiz on. Choose the details you want to collect, whether you want people to be able to skip opting in (it’s good form to let people skip opting in) and update the details of the opt-in form. Consider offering an incentive to your quiz finishers to get them to subscribe. For example, you might offer them a relevant opt-in freebie or a coupon. Choose your email service provider from the list. I use ConvertKit, so I’ll show you what the integration looks like for it. The first time you integrate Interact with your email provider, you’ll need to authenticate the connection. Don’t worry, Interact will guide you through it! Set up a new form in ConvertKit to funnel your subscribers into from the quiz. I like to ‘Add to form’ so that my subscribers show up in my ConvertKit dashboard. You can set up different actions to take for subscribers who get different results. Click Save and Continue. You now get a chance to add people to forms and sequences based on individual answers. How crazy cool is that? Once you’re done, click Save and Continue. 16. Make sure name and email address are mapping to the right place in your email service provider on the next screen. Click Save and Continue. 17. Click Test Integration to make sure it’s working. 18. Click Save and Exit. 19. Grab the link from Share and Embed. It’ll ask you to publish changes, do so! How to Get Traffic to Your Quiz? My favorite way is to embed my quiz in a blog post. You don’t need to do any more writing… just having the quiz is fine! That way it appears in your list of posts and you can promote it like you normally would. Are You Ready to Make a Quiz? Now that you’re armed with this tutorial, are you ready to get out and make a quiz of your own? Go sign up for an account at Interact! Let us know what your quiz is going to be about in the comments below! If you enjoyed this post, please share it so others can enjoy it too!